Our work wouldn’t be possible without the contributions of the many outstanding postdoctoral fellows, graduate students, and research assistants who are part of the Centre. Each brings a unique set of skills and interests, and we rely on one another to ensure the highest quality research (as well as lots of fun)! We are often looking for bright, committed individuals to join us. 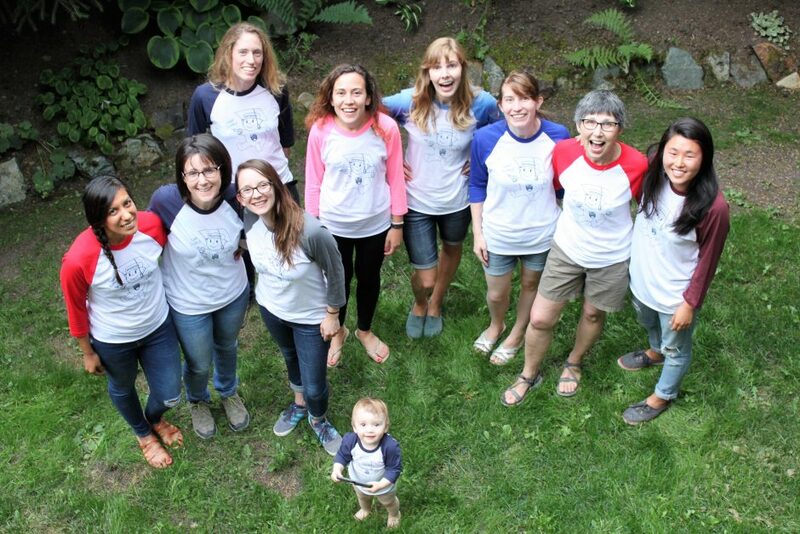 Our team in Whistler in September 2017 (from left): Dr. Maria Arredondo, Alexis Black, Megan Keough, Dr. Nicole Sugden, Dr. Loreto Nacar Garcia, Sav Nijeboer, Dr. Rebecca Reh, Dr. Janet F. Werker, Sheri Choi… and baby Evelyn! Typically, two to five postdoctoral fellows round out the interdisciplinary research efforts of the Centre. Their backgrounds include not only developmental psychology, but also neuroimaging, linguistics, and experience with different behavioural testing methods. Some postdoctoral fellows bring their own funding, and others are supported by specific grants to the Centre. We welcome enquiries from recent (or upcoming) PhDs; please contact Dr. Janet Werker (Director) directly. We welcome applications from outstanding students passionate about learning more about how perceptual biases and developmental achievements in infancy help bootstrap language acquisition. Please consult the UBC Psychology Department webpage for instructions on how to apply to a relevant graduate program (Developmental Psychology, Cognitive Psychology, Neuroscience, etc. ), and do feel free to let Dr. Janet Werker (Director) know that you are applying. We welcome applications from undergraduate students interested in the field of language development in young infants. We ask for a year-long commitment (two terms) of at least 9 hours per week. New Research Assistants typically join us as volunteers (there may later be funding opportunities available such as the NSERC USRA program), and typically begin with administrative tasks such as data entry, coding, and preparing documents for the next day’s studies. For Research Assistants who are punctual, reliable, detail-oriented, and enthusiastic, there is indeed the opportunity for more research-related work as well as a stellar reference letter from Dr. Werker! We typically begin hiring new Research Assistants just before the beginning of each term (e.g. late summer for the September term). To apply, please e-mail a CV, unofficial transcript, and a brief statement of interest to Jack Hart Smith (Research Coordinator), or drop off your application directly to the Centre. 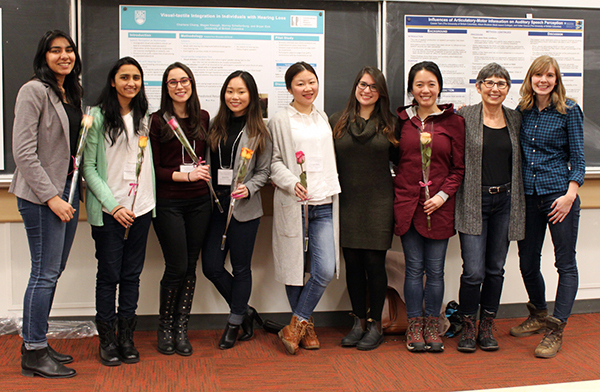 Some of our wonderful Research Assistants at the 2017 Language Sciences Undergraduate Research Conference: Tanya Sharma, Kunashni Parikh, Lal Koyuncu, Ariel Ko, Cassie Tam, Mikayla Blumenthal, and Kristina Chang with Dr. Janet F. Werker (Director) and Sav Nijeboer (Research Manager).